You'll be £14.99 closer to your next £10.00 credit when you purchase Voices of the Codebreakers. What's this? Alongside the open conflict of World War II there were other, hidden wars - the wars of communication, in which success depended on a flow of concealed and closely-guarded information. Smuggled written messages, secretly transmitted wireless signals, or months of eavesdropping on radio traffic meant operatives could discover in advance what the enemy intended to do. This information was passed on to those who commanded the armies, the fleets and the bomber formations, as well as to the other secret agents throughout the world who were desperately trying to infiltrate enemy lines. Vital information that turned the tide of battle in North African desert and on the Pacific Ocean proved to have been obtained by the time-consuming and unglamorous work of cryptanalysts who deciphered the enemy's coded messages, and coded those for the Allies. From the stuffy huts of Bletchley Park to the battles in the Mediterranean, the French and Dutch Resistance movements and the unkempt radio operatives in Burma, the rarely-seen, outstanding stories collected here reveal the true extent of the 'secret war'. The ongoing need for secrecy for decades after the war meant that the outstanding achievements of wartime cryptanalysts could not be properly recognised. 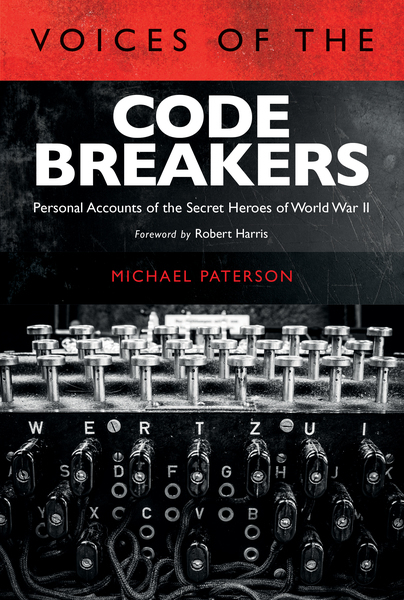 With vivid first-hand accounts and illuminating historical research, VOICES OF THE CODEBREAKERS reveals and finally celebrates the extraordinary accomplishments of these ordinary men and women. A very worthy look at code breaking activities. Michael Paterson is a military historian, author, researcher and illustrator. He began his career on the military magazine 'Battlefields Review' as a writer and illustrator, before working in the printed books department at the Imperial War Museum, London. He has worked closely with many international archives as a researcher and has lectured frequently on military history and related subjects. He is also the author of Winston Churchill: His Military Life, 1895-1945.